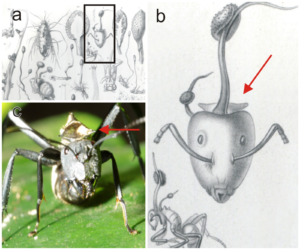 Ophiocordyceps unilateralis is an entomopathogen, or insect-pathogenising fungus, discovered by the British naturalist Alfred Russel Wallace in 1859, and currently found predominantly in tropical forest ecosystems. O. unilateralis, also referred to as a zombie fungus, infects ants of the Camponotini tribe, with the full pathogenesis being characterized by alteration of the behavioral patterns of the infected ant. Infected hosts leave their canopy nests and foraging trails for the forest floor, an area with a temperature and humidity suitable for fungal growth; they then use their mandibles to affix themselves to a major vein on the underside of a leaf, where the host remains until its eventual death. The process leading to mortality takes 4–10 days, and includes a reproductive stage where fruiting bodies grow from the ant’s head, rupturing to release the fungus’s spores. O. unilateralis is in turn also susceptible to fungal infection itself, an occurrence which can limit its impact on ant populations, which has otherwise been known to devastate ant colonies. O. unilateralis and related species are known to engage in an active secondary metabolism, among other reasons, for the production of substances active as antibacterial agents that protect the fungus-host ecosystem against further pathogenesis during fungal reproduction. Because of this secondary metabolism, an interest in the species has been taken by natural products chemists, with corresponding discovery of small molecule agents (e.g. of the polyketide family) of potential interest for use as human immunomodulatory, antiinfective, and anticancer agents. The scientific name is sometimes written Ophiocordyceps unilateralis sensu lato, which means “in the broad sense”. This is because the species is actually a complex of many species within O. unilateralis. The species can be identified at the end of its lifecycle by its reproductive structure, consisting of a wiry yet pliant darkly pigmented stroma stalk extending from the back of the dead ant’s head. The stalk has perithecia just below its tip. The fungus infects ants, most known as the carpenter ants, in which the fungus creates a single stalk arising from the dorsal neck region on which the spore-bearing sexual structures are borne horizontally. Once infected with the fungus, the ant will climb down from its normal habitat and bite down on the underside of a leaf. This is known as “the death grip” and occurs in very specific locations. Like other fungi pathogenic to insects in the Ophiocordyceps genus, O. unilateralis targets a specific host species, the Camponotus leonardi ant. However, the fungus may parasitize other closely related species of ants with lesser degrees of host manipulation and reproductive success. The spores of the fungus attach to the ant, eventually breaking through the exoskeleton using mechanical pressure and enzymes. Yeast stages of the fungus spread in the ant’s body and presumably produce compounds that affect the ant’s hemocoel, utilizing the evolutionary trait of an extended phenotype to manipulate the behavioral patterns exhibited by the ant. An infected ant exhibits irregularly timed full body convulsions that dislodge it to the forest floor. The ant climbs up the stem of a plant and uses its mandibles with abnormal force to secure itself to a leaf vein, leaving dumbbell-shaped marks on it. A search of plant-fossil databases revealed similar marks on a fossil leaf from the Messel Pit, which is 48 million years old. Once the mandibles of the ant are secured to the leaf vein, atrophy quickly sets in, destroying the sarcomere connections in the muscle fibers and reducing the mitochondria and sarcoplasmic reticula. The ant is no longer able to control the muscles of the mandible and will remain fixed in place. This lockjaw trait is popularly known as the death grip, and is essential in the fungus’s lifecycle. The fungus then kills the ant, and continues to grow as its hyphae invade more soft tissues and structurally fortify the ant’s exoskeleton. More mycelia then sprout out of the ant, and securely anchor it to the plant substrate while secreting antimicrobials to ward off competition. When the fungus is ready to reproduce, its fruiting bodies grow from the ant’s head and rupture, releasing the spores. This process takes four to ten days. The changes in the behavior of the infected ants are very specific, giving rise to the popular term “zombie ants”, and are tuned for the benefit of the fungus. The ants suffer from convulsions, causing them to fall to the ground and preventing them from finding their way back to the canopy. The ants generally clamp to a leaf’s vein at a mean height of 25.20 ± 2.46 cm above the forest floor, on the northern side of the plant, in an environment with 94–95% humidity and temperatures between 20 and 30 °C (68 and 86 °F). Infections may lead to 20 to 30 dead ants per square meter. “Each time, they are on leaves that are a particular height off the ground and they have bitten into the main vein [of a leaf] before dying.” When the dead ants are moved to other places and positions, further vegetative growth and sporulation either fails to occur or results in undersized and abnormal reproductive structures. The fungus occurs in the tropical forests of Thailand as well as the Brazilian rainforests. O. unilateralis has been known to destroy entire ant colonies. In response, ants have evolved the ability to sense that a member of the colony is infected; healthy ants will carry the dying one far away from the colony in order to avoid fungal spore exposure. Throughout the life cycle, there are unique challenges that must be met by equally unique metabolic activities. The fungal pathogen must attach securely to the arthropod exoskeleton and penetrate it—avoiding or suppressing host defenses—then, control the behavior of the host before killing it; and finally, it must protect the carcass from microbial and scavenger attack. The Ophiocordyceps fungus contains various known metabolites, as well as a number of structurally uncharacterized substances; these natural products are reportedly being investigated as potential leads in discovery efforts toward immunomodulatory, antitumor, hypoglycemic, and hypocholesterolemic targets. Six known naphthoquinone derivatives have been isolated from O. unilateralis, namely erythrostominone, deoxyerythrostominone, 4-O-methyl erythrostominone, epierythrostominol, deoxyerythrostominol, and 3,5,8-trihydroxy-6-methoxy-2-(5-oxohexa-1,3-dienyl)-1,4-naphthoquinone, which have shown activity in in vitro assays related to anti-malarial drug discovery. There has also been research into the use of red naphthoquinone pigments made by O. unilateralis as a dye for food, cosmetic and pharmaceutical manufacturing processes. O. unilaterlis produces naphthoquinone, which under acidic conditions shows a red color and under basic conditions shows a purple color. These pigments are stable against acid/alkaline conditions, light and non-cytotoxic, which makes them applicable food coloring as well as dyeing of other materials. These attributes also make it a prime candidate for anti-tuberculoid testing in secondary TB patients, by improving symptoms and enhancing immunity when combined with chemotherapeutic drugs. O. unilateralis suffers from an unidentified fungal hyperparasite, reported in the lay press as the “anti-zombie-fungus fungus”, that results in only 6–7% of sporangia being viable, limiting the damage O. unilateralis inflicts on ant colonies. The hyperparasite moves in to attack Ophiocordyceps unilateralis as the fungal stalk emerges from the ant’s cadaver, which can stop the stalk from releasing its spores. The density of infected ants and graveyards of dead ants are numerous and spread throughout the surrounding area of the colony. Even though O. unilateralis is very virulent, only about 6.5% of all fruiting bodies are viable spore-producers. This is caused by the castration of the fungus by the hyperparasite, which may cause the limiting of the viable infectious spores. Ants also groom each other to combat microscopic organisms that could potentially harm the colony. This shows that the colony is not in as much danger as previously thought. Additional fungi grant beneficial assistance to the colony as well. Jump up^ “Ophiocordyceps unilateralis”. MycoBank. International Mycological Association. Retrieved 2011-07-19. Jump up^ Mongkolsamrit S, Kobmoo N, Tasanathai K, Khonsanit A, Noisripoom W, Srikitikulchai P, Somnuk R, Luangsa-ard JJ (2012). “Life cycle, host range and temporal variation of Ophiocordyceps unilateralis/Hirsutella formicarum on Formicine ants”. Journal of Invertebrate Pathology. 111 (3): 217–24. PMID 22959811. doi:10.1016/j.jip.2012.08.007. Jump up^ Evans HC, Elliot SL, Hughes DP (March 2011). “Hidden Diversity Behind the Zombie-Ant Fungus Ophiocordyceps unilateralis: Four New Species Described from Carpenter Ants in Minas Gerais, Brazil”. PLoS ONE. 6 (3): 1–9. Bibcode:2011PLoSO…617024E. PMC 3047535  . PMID 21399679. doi:10.1371/journal.pone.0017024. ^ Jump up to:a b Pontoppidan MB, Himaman W, Hywel-Jones NL, Boomsma JJ, Hughes DP (12 March 2009). “Graveyards on the move: The spatio-temporal distribution of dead Ophiocordyceps-infected ants”. PLoS ONE. 4 (3): e4835. Bibcode:2009PLoSO…4.4835P. PMC 2652714  . PMID 19279680. doi:10.1371/journal.pone.0004835. ^ Jump up to:a b Sung GH, Hywel-Jones NL, Sung JM, Luangsa-Ard JJ, Shrestha B, Spatafora JW (2007). “Phylogenetic classification of Cordyceps and the clavicipitaceous fungi”. Studies in Mycology. 57 (1): 5–59. PMC 2104736  . PMID 18490993. doi:10.3114/sim.2007.57.01. ^ Jump up to:a b c Evans HC, Elliot SL, Hughes DP (September–October 2011). “Ophiocordyceps unilateralis – A keystone species for unraveling ecosystem functioning and biodiversity of fungi in tropical forests?”. Communicative Integrative Biology. 4 (5): 598–602. PMC 3204140  . PMID 22046474. doi:10.4161/cib.4.5.16721 (inactive 2017-01-15). ^ Jump up to:a b c d e Sample, Ian (18 August 2010). “‘Zombie ants’ controlled by parasitic fungus for 48m years”. News » Science » Microbiology. The Guardian. Retrieved 2010-08-22. ^ Jump up to:a b c Andersen SB, Gerritsma S, Yusah KM, Mayntz D, Hywel-Jones NL, Billen J, Boomsma JJ, Hughes DP (September 2009). “The life of a dead ant: The expression of an adaptive extended phenotype”. The American Naturalist. 174 (3): 424–433. JSTOR 10.1086/603640. PMID 19627240. doi:10.1086/603640. ^ Jump up to:a b Hughes DP, Andersen SB, Hywel-Jones NL, Himaman W, Billen J, Boomsma JJ (May 2011). “Behavioral mechanisms and morphological symptoms of zombie ants dying from fungal infection”. BMC Ecology. 11 (1): 13–22. PMC 3118224  . PMID 21554670. doi:10.1186/1472-6785-11-13. Jump up^ “Fossil Reveals 48-Million-Year History of Zombie Ants”. Science Daily. 18 August 2010. Retrieved 2010-09-12. ^ Jump up to:a b Hughes DP, Wappler T, Labandeira CC (23 February 2011) [18 August 2010]. “Ancient death-grip leaf scars reveal ant fungal parasitism”. Biology Letters. Royal Society. 7 (1): 67–70. PMC 3030878  . PMID 20719770. doi:10.1098/rsbl.2010.0521. Jump up^ “Zombie Ants have fungus on the brain, new research reveals”. Science Daily. 2011. Retrieved 2012-11-27. Jump up^ Attenborough, David (3 November 2008). “Cordyceps: attack of the killer fungi”. Planet Earth. BBC Worldwide. Retrieved 2013-04-21. Jump up^ Harmon, Katherine (31 July 2009). 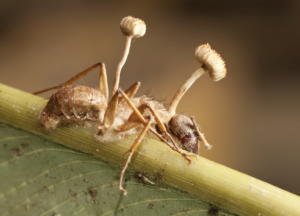 “Fungus makes zombie ants do all the work”. Scientific American. Retrieved 2010-08-22. Jump up^ Xiao JH, Zhong JJ (2007). “Secondary metabolites from Cordyceps species and their antitumor activity studies”. Recent Patents on Biotechnology. 1 (2): 123–137. PMID 19075836. doi:10.2174/187220807780809454. Jump up^ Kittakoopa P, Punyaa J, Kongsaeree P, Lertwerawat Y, Jintasirikul A, Tanticharoena M, Thebtaranonth Y (1999). “Bioactive naphthoquinones from Cordyceps unilateralis“. Phytochemistry. 52 (3): 453–457. doi:10.1016/S0031-9422(99)00272-1. Jump up^ Wongsa P, Tasanatai K, Watts P, Hywel-Jones N (August 2005). “Isolation and in vitrocultivation of the insect pathogenic fungus Cordyceps unilateralis“. Mycological Research. 109 (Pt 8): 936–940. PMID 16175796. doi:10.1017/S0953756205003321. Jump up^ Unagul P, Wongsa P, Kittakoop P, Intamas S, Srikitikulchai P, Tanticharoen M (April 2005). “Production of red pigments by the insect pathogenic fungus Cordyceps unilateralisBCC 1869″. Journal of Industrial Microbiology and Biotechnology. 32 (4): 135–140. PMID 15891934. doi:10.1007/s10295-005-0213-6. Jump up^ Isaka M, Kittakoop P, Kirtikara K, Hywel-Jones NL, Thebtaranonth Y (2005). “Bioactive substances from insect pathogenic fungi”. Acc. Chem. Res. 38 (10): 813–23. PMID 16231877. doi:10.1021/ar040247r. Jump up^ Wang, Enlai DA, Zhong JI (2013). “A Retrospective Analysis of Cordyceps Anti-Tuberculosis Capsule Combined with Chemotherapy for 614 Cases of Secondary Tuberculosis”. Journal of Traditional Chinese Medicine. 15. Jump up^ “The Zombie-Ant Fungus Is Under Attack, Research Reveals”. Pennsylvania State University. 2012-05-02. Retrieved 2013-03-04. ^ Jump up to:a b Andersen SB, Ferrari M, Evans HC, Elliot SL, Boomsma JJ, Hughes DP (2 May 2012). “Disease Dynamics in a Specialized Parasite of Ant Societies”. PLoS ONE. 7 (5): e36352. Bibcode:2012PLoSO…736352A. PMC 3342268  . PMID 22567151. doi:10.1371/journal.pone.0036352. Ophiocordyceps unilateralis at UniProt.org. Accessed on 2010-08-22.